Ten summers ago, I said a scary-good prayer. At the time it was just scary. Now I know it was good. It was through grit teeth. Have you had those? Fingers initially clenched but released with this first sentence “Fine, God.” So eloquent, right? Fine, God. Those two words essentially shape all theological history. Fine, God. Your way over my way. The next sentence of that specific prayer went: “I will go home and marry Jason Miller.” Jason Miller was a boy I’d not spoken to in nine months, had never dated, and to be honest, didn’t want to. A little back-story, if you will. It was the summer of 2003, and I was in Nashville, Tennessee. No, not to find myself in a country music career, but certainly to find myself. As a good start, I decided to go by my middle name. And I accepted a job way outside my comfort zone. I pulled up to Belmont University and introduced myself as Mardell, on the Creative Arts Team. A world removed from Brooke, Attorney at Law. That summer, I would discover that both were the real me. I joined a staff that would transform me. Each of them uniquely spoke into my life that summer in ways that they’ll never fully know. And Jesus was in hot pursuit. With a specific mission in mind. Mission-Marry-Jason-Miller. While we’d been friends for nine years and flirted on and off for three, I had closed that door long ago. I had my reasons, and none of them were scandalous, but they were valid. So I closed that door. Closed the way that you close a shipping box, not expecting to ever see the stuff inside again. But unbeknownst to me, there was a “return to sender” label snuck on there. And that summer, it came back. It came in unexpected ways. In dreams, in random thoughts, and even through friendships that pointed me back to thinking of this man I’d left behind. My heart was stirred, but it bothered me. It bothered me because this boy was outside my plan, my idea. Slowly, deliberately, the Spirit was relentless. Slowly, painfully, I surrendered. One thing at a time. Yes, yes Lord, you can have the pen to write my love story. Yes, yes I trust you to make better decisions than I do. Yes, yes fine, I would be willing to date Jason, and you know, see if there’s anything there. It wasn’t enough. I got no rest. None. Until the day that I prayed the most transformative prayer of my life to that date: “Fine, I will go home and marry Jason Miller.” I actually had no idea that I really would, in fact, go home and marry Jason Miller the following summer. I really truly thought the issue was surrendering even to that extent. I had no idea God would take me up on it. But finally, finally I had rest. I finally wasn’t trying to write my own story anymore. I was totally and completely surrendered. I’d never felt free-er. I’d never prayed such a scary prayer. I didn’t yet know how good it would be. 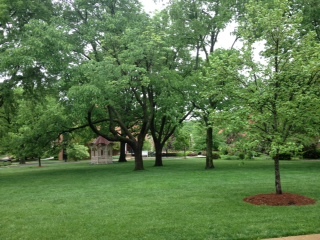 Last weekend, ten summers later, I again walked the Belmont campus in Nashville. The specificity of memories overwhelmed me. Flooded my senses. All at once I remembered the battle and the surrender. All at once I could see the faces and remember the conversations that had shaped me that summer. With the benefit of ten years hindsight, my tears flowed freely as I thanked God that I did, in fact, go home and marry Jason Miller. That in so doing, I received the best gift I could have ever imagined. Better than I imagined, actually. Our ten years together have been rich, and deep, and powerful, and playful, and painful, and I wouldn’t trade them for anything at all in the entire world. And as I walked, I was soon brought to my knees as I realized God was asking me to speak another scary prayer. More terrifying to me than the last, really. You see, ever since I opened my hands up to what God wanted to give me, I’ve been afraid that he would take it away. I don’t know where that fear was planted, but what I do know is that for ten years I’ve lived in this tension. I know first-hand that He is a God who GIVES. I also know first-hand that He is a God who TAKES AWAY. A God who gives an around-the-world experience, but also takes away health. Who gives family and light and love, and takes life through cancer. Who gives a beautiful marriage, and takes away fertility. Who gives a house, and takes away jobs. I want to worship this God who gives AND takes away. But too often I’m left paralyzed and confused. At a stalemate. There, back in that place where I’d prayed ten years before, I knew the words Jesus was asking me to say. The words to end the stalemate. Jesus, please take only what you must take, and please give all that you are willing to give. This prayer is a game-changer for me. I have focused much on His taking in the last few years. His taking has hurt me, wounded me, and left holes in my heart. I have thought He might arbitrarily take something away if I gave Him this kind of permission. Or worse, that He might take something away to teach me that He can. Well, He has. He has taken. Dare I trust that He only takes away what He absolutely must? I’m choosing to trust just that. But the bigger shift is here: I have never asked Him to give all He is willing to give. I don’t think I can even comprehend all He’s willing to give. I’ve been too afraid to ask for it because the more He gives the more He can take, right? Take what you must, but please give all you are willing to give. This is my new prayer. I am so excited. I am so terrified. Just as I was on the day that I uttered that scary-good prayer agreeing to go home and marry this man I’d never dated. In 2023, what will be the tale that came from this prayer? What will He be willing to give? What must He take? Oh goodness, just typing those words fills me with exhilaration and fear. So. Scary. Good. XOXO friend! So thankful for all the ways YOU have been a spiritual mama to me over the years; humbled to be used even slightly in return.